Please send me more information on La Isla ! This scenic cruise experience is like none other in the unique Sea of Cortés. Enjoy the perfect mix of luxury and adventure during what is sure to be a fantastic day on the water. 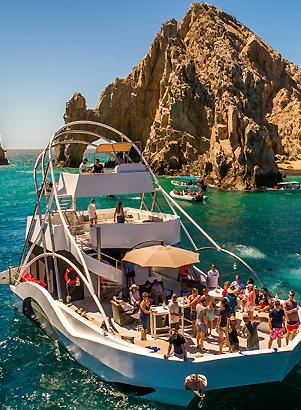 Explore Baja’s spectacular coast, Lover’s Beach and The Arch dropping anchor off scenic Pelican Rock to enjoy snorkeling around hundreds of tropical fish. This newly launched luxury vessel is essentially a posh beach club on the water. Amenities include a private chef, hand crafted cocktails, lounge chairs on the decks, and an array of water toys, kayaks, SUP boards, floating mats, and more! Contact your Cabo Specialist for complete menus and for rates and information on special decorations or catering! La Isla is an experience like no other! This custom 40-foot catamaran features stylish lounge furniture, 2 bathrooms, a full kitchen, ice coolers, an excellent sound system, 60” TV, paddle boards and snorkeling gear. 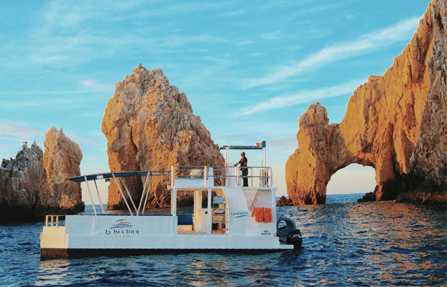 Whether you choose to spend a day cruising to some of the best snorkeling spots in Cabo San Lucas Bay or reserve La Isla for a sophisticated party at sea or intimate wedding surrounded by family and friends, this one-of-a-kind vessel offers a unique way to experience the breathtaking sights of Los Cabos from the water! Bring your own food and beverages for the day or allow us to provide delicious catering options for you. La Isla Mediana is also a custom catamaran. This 35-ft vessel comes arranged with lounge furniture and offers one bathroom, a double deck, paddle boards and snorkeling gear. Customize your trip by choosing a cruise to Lover’s Beach, a snorkeling excursion or a sunset cruise. Bring your own food or enjoy some customized catering to make your experience even more special! Contact your Cabo Specialist for rates and information on special decorations or catering! 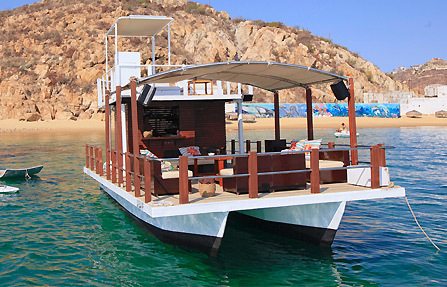 La Isla Fe is also a custom made two story catamaran. This 35-ft vessel offers one bathroom, a double deck, paddle boards and snorkeling gear. Customize your trip by choosing a cruise to Lover’s Beach, a snorkeling excursion or a sunset cruise. Bring your own food or enjoy some customized catering to make your experience even more special! La Isla Chica is also a custom catamaran. This 30-ft vessel comes arranged with lounge furniture and offers one bathroom, an ice cooler, sound system, paddle boards and snorkeling gear. Customize your trip by choosing a cruise to Lover’s Beach, a snorkeling excursion or a sunset cruise. Bring your own food or enjoy some customized catering to make your experience even more special! 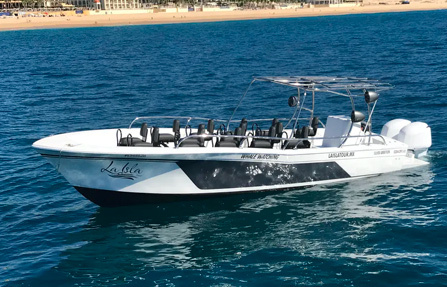 La Isla Mini is also a custom catamaran. 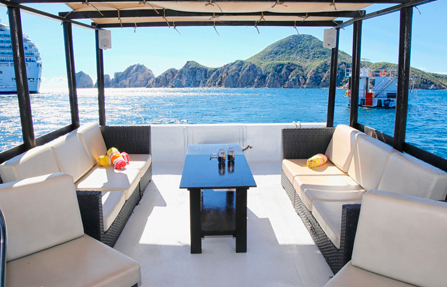 This vessel comes arranged with lounge furniture, an ice cooler, sound system, and snorkeling gear. Customize your trip by choosing a cruise to Lover’s Beach, a snorkeling excursion or a sunset cruise. Bring your own food or enjoy some customized catering to make your experience even more special! 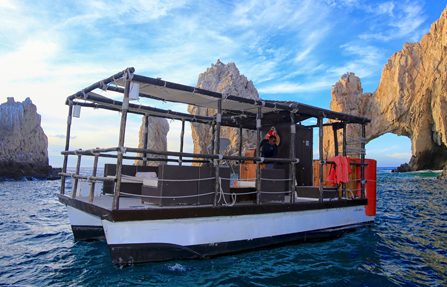 Enjoy the combination of speed, comfort, beauty, and exclusivity in the custom made whale watching boat! You and up to 18 passengers will run wild in the Pacific Ocean and Sea of Cortes searching for the world’s largest mammals. 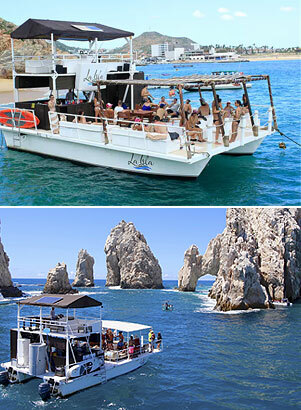 Soak in the beautiful scenery and all points of interest of Cabo San Lucas bay visiting all landmarks such as The Arch, Lover’s Beach, Divorce Beach and the Sea Lion Colony. Your crew will not only tell you all about the whales, but will keep eyes wide open for all kinds of wildlife. Feel the power of the 500 HP outboard engines, and find yourself flying at speeds of up to 40 knots without sacrificing your back and knees with the comfort of a suspension seat.